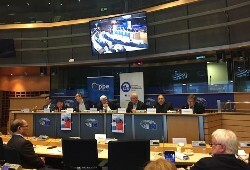 DHARAMSHALA, Jan. 25: Members of European Parliament hosted a session on ‘Freedom of Religion in China’ in the European Parliament in Brussels on Wednesday. Senior MEPs Bas Belder (ECR), Christian Dan Preda (EPP) and Josef Weidenholzer (S&D) headed the two- hour long session. The Speakers at the session highlighted the lack of religious freedom in China including occupied Tibet and Chinese controlled regions such as Xinjiang and how the persecution is uniform across different religious traditions including Buddhism, Islam as well as Christianity by the Communist party of China. MEP Christian Dan Preda reiterated the EU’s urgency in addressing the issue particularly in Tibet where he highlighted the destruction of its age old Buddhist learning institute Larung Gar in the past year as a direct result of Beijing’s persecution of Buddhists in Tibet. Mr Omar Bekali, a Uighur residing in the US made an emotional testimony on the current internment of Uighurs in East Turkistan where he said that organs of the internees are being harvested by China and that Uighur women in desperation to save their family members would enlist to marry Han Chinese, reported Tibet.net, the official website of the Central Tibetan Administration. Father Bernardo Cerveillera spoke on the persecution of Catholics in China and Beijing’s harsh policies against the Christian community there that saw razing of churches and place of worships of devotees there. Representative Tashi Phuntsok and EU Advocacy Officer Rigzin Choedon Genkhang of Office of Tibet Brussels attended the proceedings on January 23. “The EU is now called upon to bear the mantle of leadership of the free world. Otherwise very soon every element of life, government, basic values and international relations worldwide may bear the unmistakable stamp of Chinese characteristics. The values of the free world and the EU may be lost,” Phuntsok told Tibet.net. For 60 years China has been using all and every wherewithal of a colonial power to wipe away Tibet from the face of this earth. But Tibet is alive, not dead, because of the support of the free world. All the instruments of repression that people in East Turkistan are perpetrated with today were fine-tuned and harshly implemented first in Tibet,” he further said.